Summer vacation should be full of fun and excitement, and for some kids, these concepts don’t always align with the idea of reading. For kids who already love to read, getting them to read over the summer can be a no brainer, and for certain children it may take no work at all. But for reluctant readers, it is important that parents make sure that reading remains a mainstay in their child’s lives. Studies have shown that children who do not read over the summer, especially when in elementary school and in early grades, may get knocked down a reading level or two. By reading consistently, kids can stay at the reading level that is appropriate for their grade and age. Here are some tips on getting kids excited about reading. Summer is often when families go out on vacation or take long trips. Vacations can be exciting and are often filled with new experiences, so take the spirit of vacation and books into the mix. Encourage kids to research the place your family is planning on visiting this summer. 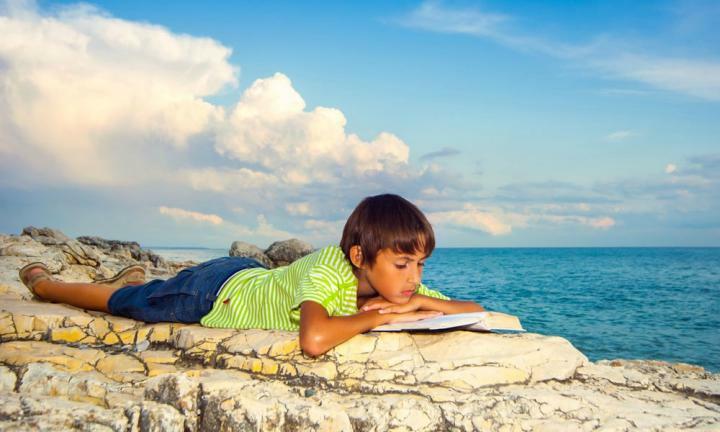 Even if you are unable to go on vacation, kids can explore other places, whether it is distant parts of the world, or fictional realms, all through the power of books. With this criteria in mind, scour the shelves of your local library or bookstore to see what you can find. Children don’t just need to be reading books over the summer they need to be reading the right ones. One of the most important factors when it comes to any activity is the willingness to actually do it. Try not to push books on kids or pick out certain titles only because you think they’re interesting. Sure, providing some suggestions can certainly help, but it is important that kids want to read what they like, and making that choice on their own is one foolproof way to ensure that. When it comes to making your own suggestions, keep your child’s interests in mind. Provide them with books on activities or subjects you already know they like. A love of learning is likely to inspire them to pick up books on other topics, too, but pushing overly educational books or books kids are simply not interested in can have the opposite effect than the one you’re going for. Whether you make a point of regularly visiting the local library with your child or have them tag along to the bookstore at the mall, making books easily accessible and within reach can help to pique their interests. Many libraries offer programs for kids during the summer months or after school that focus on reading but may also include activities like crafts and games that go hand-in-hand with the reading material. If your child has other interests, whether it’s drawing, performing, or even talking a lot, you can incorporate these interests into the act of reading. Does your child like to doodle? Have them create illustrations for a book without any pictures. Is your child a movie star in the making? Encourage them to put on a play version of the last book they read for the family. Do they like to hear the sound of their own voice? See if they’ll record themselves reading a book aloud as if they are a radio announcer or an audiobook narrator. There are plenty of ways in which reading can be dynamic, especially if other activities are thrown into the mix.